Holy Anointing, or Unction, is one the Seven Mysteries of the Church mentioned in Holy Scripture, which is celebrated in a church or in the home to cure illnesses of the body and the soul. The Unction of Holy Wednesday does not have a magical effect on our spiritual life, but it is part of an unbreakable chain together with the other Mysteries in which we must participate, namely Confession and Holy Communion. The origins of Anointing, as that of the other Mysteries, is found in the New Testament, specifically the Catholic Epistle of Saint James (5:14-15): "Is anyone among you sick? Let him call for the presbyters of the church, and let them pray over him, anointing him with oil in the name of the Lord. And the prayer of faith will save the sick, and the Lord will raise him up. And if he has committed sins, he will be forgiven." Thus, the apostolic order is the basis on which is founded the faith and ritual acts of the Church. Those who perform this philanthropic Mystery are the presbyters of the Church, who are invited to the home of a sick Christian for this purpose. Near the patient they pray fervently. They invoke the grace of the All-Holy Spirit to bless the oil which is distributed. Then the sick Christian is anointed with the blessed oil. The anointing with the blessed oil saves the sick. The Service of Anointing is performed for "the healing of soul and body". According to the teaching of the Church, physical illness is regarded as a bitter fruit of sin. Any sickness as a disorder of the harmonious functioning of the body is due to spiritual causes, mainly a disruption of man's relationship with God. In the sacred texts there is not only a close association of the sickness with sin, but at the same time it indicates a way of therapy: sincere repentance and return to God. For the celebration of the Mystery there is placed on a table a Holy Gospel, a small icon of Christ, a lit oil lamp contained with flour, beside which are seven lit candles. The oil lamp should be clean and inside should be pure olive oil, to indicate a pure and sincere offering to God. This is why the Good Samaritan in the homonymous parable, is lovingly nursed of his injurious wounds with olive oil and wine. The oil, after the prayers of the priest, is no longer common oil. The same with baptism: the baptismal water, after the prayers of the liturgist, is no longer common water. At the end of the service is the anointing with the holy oil. We are anointed crosswise on the forehead, chin, both cheeks, and in the inside and outside of each hand. With this anointing, the priest asks the Lord for the healing of spirit, thought and our entire inner world. Furthermore, that it give strength to the members of the body with which we make the most use (ex. the hands are the means by which we execute the commands of our minds). 1. First of all, some consider that the forgiveness prayer of the Anointing substitutes for Confession, which may not have been done for various reasons. The forgiveness prayer of Anointing does not abolish the need for the forgiveness prayer of Confession. The forgiveness of sins that comes from the Mystery of Anointing does not mention the sins we know of and do not confess, but those which are forgotten or unknown. No Mystery of the Church contradicts or abolishes another, but they compliment one another in the great "Mystery" of the Church. 2. Another misunderstanding occurs with the flour, which is used to support the candles. 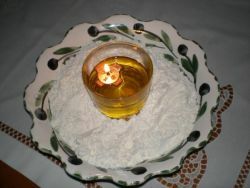 Some of the faithful are not satisfied with the anointing of the holy oil, but they ask for the flour to be used in various cases: to put it under the pillow of their child "that God may show them their luck", or that "evil may depart from the house", or to dilute it with water and have the patient drink it. Because these things touch upon superstition, we must emphasize that the Mystery is called Anointing and not "Flouring". That which is sanctified is the oil and not the flour. 3. There is another misunderstanding, which confuses the purpose of Anointing. Many ask for Unction to inaugurate their new home or business. There are other sanctifying acts that are to be done for homes, businesses, vehicles and other things. Still there are other people who ask the priest to perform a Sanctification of the Waters ceremony with Holy Unction, showing confusion and misunderstanding. It's as if you need more than one sanctifying act to request the grace of God. 4. Another misunderstanding is the perception that Unction is associated with the dying and those who are generally in the final stages of their sickness. It is thus avoided out of fear that it may accelerate the death of a patient. This fear, however, is unwarranted. The relatives are afraid to tell the patient. The patient is afraid to ask. Holy Unction is for health and life. All the prayers and supplications of the Mystery are for health and life. Finally, it is necessary to address a complaint: Why is there not always a cure? The Mystery of Anointing was not established to eliminate all illness, death and the need for medical science. Many times it brings an indirect treatment. Furthermore, treatment depends on the faith of a person and the will of God. Though the same grace is given to all, not all are healed. Treatment may not be in the greatest interest for a person. It is primarily to help guide the sick to lead them confidently to Christ's salvation: in this way would be achieved the ultimate goal of the Mystery. The holy oil is not to be discarded but kept! It should burn in the oil lamp until it is completely extinguished. After it is completely extinguished, everything used to clean the lamp and its content are to be burned in a fire in a safe place.